Permanent implants are being used with increasing regularity to replace defective parts of the human skeleton. 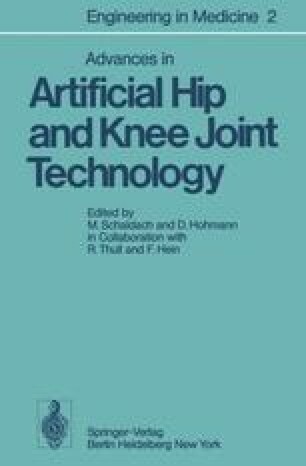 By this increasing number of implantations, especially in the hip region, the advantages and limits of endoprosthetics are disclosed. The primary objective of our investigations is to increase the biocompatibility of a skeletal replacement part. The term “biocompatibility” expresses the degree of adaptive interaction between the implant and biological tissue (Fig. 1). Therefore, it is not sufficient either to change only a few constructive details, use improved materials, or apply different surgical procedures or therapies. All conceivable parameters must be considered. Corrosion and metallosis, different E-moduli, alteration of plastics in the sense of water absorption, aging, volume variations, exothermic heat reaction, and liberation of monomers represent negative factors of today’s endoprosthetics. The same is true concerning the neglecting of biomechanical laws.